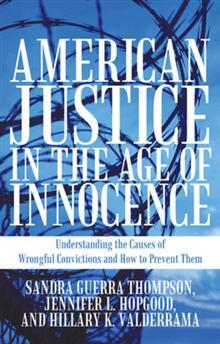 American justice in the age of innocence : understanding the causes of wrongful convictions and how to prevent them / edited by Sandra Guerra Thompson, Jennifer L. Hopgood, Hillary K. Valderrama. IUniverse, c2011. This collection of essays, edited by Professor Sandra Guerra Thompson and former UHLC students Jennifer L. Hopgood and Hillary K. Valderrama, discusses the causes of wrongful conviction in order to find solutions to this growing problem. In doing so, it examines critical issues such as what American justice in the age of innocence looks like, how to implement procedural mechanisms to ensure the integrity of the judicial system while safeguarding the public, and whether or not the legal system is doing a good enough job uncovering wrongful convictions. James Harrison. 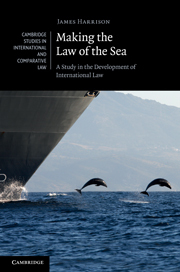 Making the law of the sea : a study in the development of international law. Cambridge University Press, 2011. This book examines how various international organizations have contributed to the development of the law of the sea and what kinds of instruments and law-making techniques have been used. Each chapter considers a different international institution – including the International Maritime Organization and the United Nations – and analyzes its functions and powers. The author also explores and evaluates the current methods employed by international institutions to coordinate their law-making activities in order to overcome fragmentation of the law-making process. Civil code of Argentina / translated by Julio Romanach, Jr. 3rd ed. Lawrence Pub. Co., c2011. Pharmaceutical, biotechnology, and chemical inventions : world protection and exploitation / edited by Duncan Bucknell, Theo Bodewig. Oxford University Press, 2011. Civil code of Brazil / translated by Julio Romañach, Jr. Lawrence Pub. Co., c2011. Robert R. Keatinge, Ann E. Conway. Keatinge and Conaway on choice of business entity : selecting form and structure for a closely-held business. West, c2011. Child protection systems : international trends and orientations / edited by Neil Gilbert, Nigel Parton, Marit Skivenes. Oxford University Press, c2011. Samuel M. Davis. Children's rights under the law. Oxford University Press, c2011. Dwight Newman. Community and collective rights : a theoretical framework for rights held by groups. Hart Pub., 2011. Elizabeth Renuart, Kathleen E. Keest. The cost of credit : regulation, preemption, and industry abuses. 4th ed. National Consumer Law Center, c2011. Dennis J. Baker. The right not to be criminalized : demarcating criminal law's authority. Ashgate, c2011. William M. Leiter, Samuel Leiter. Affirmative action in antidiscrimination law and policy : an overview and synthesis. 2nd ed. State University of New York, c2011. David Hamilton Golland. Constructing affirmative action : the struggle for equal employment opportunity. University Press of Kentucky, c2011. Patrick Parkinson. Family law and the indissolubility of parenthood. Cambridge University Press, 2011. Mitchel A. Sollenberger. Judicial appointments and democratic controls. Carolina Academic Press, c2011. Joseph Bankman, Thomas D. Griffith, Katherine Pratt. Federal income tax : examples and explanations. 6th ed. Wolters Kluwer Law & Business, c2011. Roland Kläger. 'Fair and Equitable Treatment' in International Investment Law. Cambridge University Press, 2011. Rodney A. Smolla. The constitution goes to college : five constitutional ideas that have shaped the American university. New York University Press, c2011. Martha Menchaca. Naturalizing Mexican immigrants : a Texas history. 1st ed. University of Texas Press, 2011. Nora Privitera. Hardship in immigration law : how to prepare a winning case in waiver and cancellation of removal cases. 12th ed. Immigrant Legal Resource Center, c2011. Intellectual property and competition law : new frontiers / edited by Steven Anderman, Ariel Ezrachi. Oxford University Press, 2011. Martin F. Gusy, James M. Hosking, Franz T. Schwarz. A guide to the ICDR international arbitration rules. Oxford University Press, 2011. Roger McCormick. Legal risk in the financial markets. 2nd ed. Oxford University Press, 2010. Christine E.J. Schwöbel. Global constitutionalism in international legal perspective. Martinus Nijhoff Publishers, 2011.
International project finance : law and practice / edited by John Dewar. Oxford University Press, 2011. Network neutrality and open access / edited by Indra Spiecker gen. Döhmann, Jan Krämer. Nomos, 2011. Christopher Slobogin, Mark R. Fondacaro. Juveniles at risk : a plea for preventive justice. Oxford University Press, c2011. Civil code of Chile, 2008 / translated by Julio Romañachh, Jr. Lawrence Pub. Co., c2008. Civil code of Colombia : 2008 / translated by Julio Romañach, Jr. Lawrence Pub. Co., c2008. Civil Code of Panama, 2009 / translated by Julio Romañachh, Jr. Lawrence Pub. Co., 2009. Marc J. Ackerman, Andrew W. Kane. Psychological experts in divorce actions. 5th ed. Wolter Kluwer Law & Business, c2011. Edwin Scott Fruehwald. Law and human behavior : a study in behavioral biology, neuroscience, and the law. Vandeplas Pub., c2011. John A. Zervopoulos. Confronting mental health evidence : a practical guide to reliability and experts in family law. ABA Section of Family Law, c2008. V & E: a story of Vinson & Elkins L.L.P / compiled by Sidney S. McClendon III and edited by C. Michael Harrington. Broadfoot Publishing Company , c2010. Ross Guberman. Point made : how to write like the nation's top advocates. Oxford University Press, c2011. Laurel Currie Oates, Anne Enquist. Just memos. 3rd ed. Wolters Kluwer Law & Business, c2011. Barry Friedman, John C.P. Goldberg. Open book : succeeding on exams from the first day of law school. Wolters Kluwer Law & Business, c2011. Julio Romañach, Jr. Teach yourself-- legal Spanish : bilingual guide to the legal terminology and laws of Latin America and Spain. Lawrence Pub. Co., c1999. Diana R. Donahoe. Experiential legal research : sources, strategies, and citation. Wolters Kluwer Law & Business, c2011. Commercial Code of Mexico : selected substantive provisions / translated by Julio Romañach, Jr. 3rd ed. Lawrence Pub. Co., c2011. Federal Civil Code of Mexico / translated by Julio Romanach, Jr. Lawrence Pub. Co., c2003. Stephen A. Saltzburg, Lee D. Schinasi, David A. Schlueter. Military rules of evidence manual. 7th ed. LexisNexis, c2011. St. Mary's journal on legal malpractice & ethics. St. Mary's University School of Law. Philip G. Joyce. The Congressional Budget Office : honest numbers, power, and policymaking. Georgetown University Press, c2011. Abraham Lincoln, Esq. : the legal career of America's greatest president / edited by Roger Billings, Frank J. Williams. University Press of Kentucky, c2010. Stuart Banner. American property : a history of how, why, and what we own. Harvard University Press, 2011. James Charles Smith. The Glannon guide to property : learning property through multiple-choice questions and analysis. 2nd ed. Wolters Kluwer Law & Business, c2011. Civil code of Spain / translated by Julio Romañach, Jr. 2nd ed. Lawrence Pub. Co., c2011. Katherine S. Newman, Rourke L. O'Brien. Taxing the poor : doing damage to the truly disadvantaged. University of California Press, c2011. Scott A. Taylor. The law of tax-exempt organizations in a nutshell. West, c2011. The Comcast/NBC Universal merger : what does the future hold for competition and consumers? : hearing before the Subcommittee on Antitrust, Competition Policy, and Consumer Rights of the Committee on the Judiciary, United States Senate, One Hundred Eleventh Congress, second session, February 4, 2010. Are there government barriers to the housing market recovery? : hearing before the Subcommittee on Insurance, Housing, and Community Opportunity of the Committee on Financial Services, U.S. House of Representatives, One Hundred Twelfth Congress, first session, February 16, 2011. Will NOAA's new leadership address serious problems in fishery law enforcement? : hearing before the Subcommittee on Domestic Policy of the Committee on Oversight and Government Reform, House of Representatives, One Hundred Eleventh Congress, second session, March 2, 2010. Examining the efficiency, stability, and integrity of the U.S. capital markets : joint hearing before the Subcommittee on Securities, Insurance, and Investment of the Committee on Banking, Housing, and Urban Affairs, United States Senate, and the Permanent Subcommittee on Investigations of the Committee on Homeland Security and Governmental Affairs, United States Senate, One Hundred Eleventh Congress, second session, on examining the efficiency, stability, and integrity of the U.S. capital markets, December 8, 2010. The government as dominant shareholder : how should the taxpayers' ownership rights be exercised? : hearing before the Subcommittee on Domestic Policy of the Committee on Oversight and Government Reform, House of Representatives, One Hundred Eleventh Congress, first session. Defense Contract Audit Agency : who is responsible for reform? : hearing before the Committee on Homeland Security and Governmental Affairs, United States Senate, of the One Hundred Eleventh Congress, first session, September 23, 2009. H1N1 flu, 2009 : hearings before the Committee on Homeland Security and Governmental Affairs, United States Senate, of the One Hundred Eleventh Congress, first session : April 29, 2009, coordinating the federal response September 21, 2009, protecting our community: field hearing in Hartford, CT October 21, 2009, monitoring the nation's response November 17, 2009, getting the vaccine to where it is most needed. State business incorporation, 2009 : hearings before the Committee on Homeland Security and Governmental Affairs, United States Senate, of the One Hundred Eleventh Congress, first session : June 18, 2009, examining state business incorporation practices: a discussion of the Incorporation Transparency and Law Enforcement Assistance Act November 5, 2009, business formation and financial crime: finding a legislative solution. Caught by surprise : causes and consequences of the helium-3 supply crisis : hearing before the Subcommittee on Investigations and Oversight, Committee on Science and Technology, House of Representatives, One Hundred Eleventh Congress, second session, April 22, 2010. S. 2686, the Communications, Consumer's Choice, and Broadband Deployment Act of 2006 : hearing before the Committee on Commerce, Science, and Transportation, United States Senate, One Hundred Ninth Congress, second session. Are agencies playing it safe and secure? : an examination of worker protections pre- and post-injury : hearing before the Subcommittee on Federal Workforce, Postal Service, and the District of Columbia of the Committee on Oversight and Government Reform, House of Representatives, One Hundred Eleventh Congress, second session, July 21, 2010. Climate change legislation : tax considerations : hearing before the Committee on Finance, United States Senate, One Hundred Eleventh Congress, first session, June 16, 2009. Covered bonds : potential uses and regulatory issues : hearing before the Committee on Banking, Housing, and Urban Affairs, United States Senate, One Hundred Eleventh Congress, second session, on examining covered bonds, their potential uses, and regulatory issues, September 15, 2010. Implementation of Iran sanctions : hearing before the Committee on Oversight and Government Reform, House of Representatives, One Hundred Eleventh Congress, second session, July 29, 2010. Promoting economic recovery and job creation : the road forward : hearing before the Committee on Financial Services, One Hundred Twelfth Congress, first session, January 26, 2011. Offshore drilling : will Interior's reforms change its history of failed oversight? : hearing before the Committee on Oversight and Government Reform, House of Representatives, One Hundred Eleventh Congress, second session, July 22, 2010. GSE reform : immediate steps to protect taxpayers and end the bailout : hearing before the Subcommittee on Capital Markets and Government Sponsored Enterprises of the Committee on Financial Services, U.S. House of Representatives, One Hundred Twelfth Congress, first session, February 9, 2011. Tracking the money : assessing the Recovery Act's impact on the state of California : joint hearing before the Committee on Oversight and Government Reform and the Subcommittee on Government Management, Organization, and Procurement of the Committee on Oversight and Government Reform, House of Representatives, One Hundred Eleventh Congress, second session, March 5, 2010. Transparency in environmental protection and climate change in China [microform] : roundtable before the Congressional-Executive Commission on China, One Hundred Eleventh Congress, second session, April 1, 2010. The Obama administration's Elementary and Secondary Education Act reauthorization blueprint [microform] : hearing before the Committee on Education and Labor, U.S. House of Representatives, One Hundred Eleventh Congress, second session, hearing held in Washington, DC, March 17, 2010. Freedom of the media in the OSCE region [microform] : hearing before the Commission on Security and Cooperation in Europe, One Hundred Tenth Congress, first session. Pipeline politics [microform] : achieving energy security in the OSCE region : hearing before the Commission on Security and Cooperation in Europe, One Hundred Tenth Congress, first session, June 25, 2007. Energy and democracy [microform] : oil and water? : hearing before the Commission on Security and Cooperation in Europe, One Hundred Tenth Congress, first session, July 23, 2007. Kazakhstan's bid to chair the OSCE [microform] : a fundamental right or a foolhardy ambition? : hearing before the Commission on Security and Cooperation in Europe, One Hundred Tenth Congress, first session, October 16, 2007. Finland's leadership in the OSCE [microform] : hearing before the Commission on Security and Cooperation in Europe, One Hundred Tenth Congress, second session, February 13, 2008. NATO enlargement [microform] : hearing before the Commission on Security and Cooperation in Europe, One Hundred Tenth Congress, second session, March 4, 2008. Hate crimes [microform] : November 6, 2007 briefing of the Commission on Security and Cooperation in Europe.